Warnings: Adult language, Sexual Content. 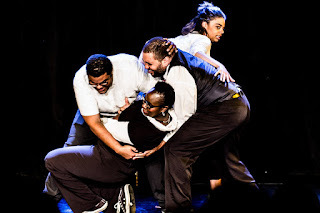 Members of this all person of color improv team take on the Minnesota Fringe in a way that only they can, with humor, swag, and a focus on social issues. Each performance will feature an amazing special guest! Blackout Improv is everything. It is ALL the things. It's hilarious, it's thought-provoking, and it's performed regularly at the Phoenix Theater in Uptown. YAY! I love discovering great shows at the Fringe that I can actually see again once the Fringe is over. Some of the funniest performers in the Twin Cities (like MN Theater Love favorites Joy Dolo Anfinson and Kory Pullam), as well as hilarious performers who are new to us (like the delightful John Grebretatose. who is officially one to watch), get together and perform improv based on suggestions from the audience. But in addition to the improv, each show includes some serious discussion of issues such as social justice, which are discussed in such an engaging way that we longed to join in the discussion. LOVE. Ooh, also during the Fringe they featured a number of special guests. We were lucky enough to see the charming Gregory Parks, a clown, improviser and all around fascinating guy.